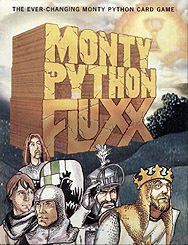 It's Monty Python Fluxx - the card game where it's fun to make your brain hurt. Get a shrubbery for the knights who say Ni! Build a giant wooden rabbit! And since it's Fluxx, you can expect the rules to constantly change... but don't expect the Spanish Inquisition!